They had been introduced to the Beuron school by Jan Verkade, a young Dutchman, son of a successful manufacturer of biscuits (the brand name is still with us), who had come to Brittany to work with Sérusier, had been converted to Roman Catholicism then entered the Beuron monastery as a monk, under the name Willibrord. 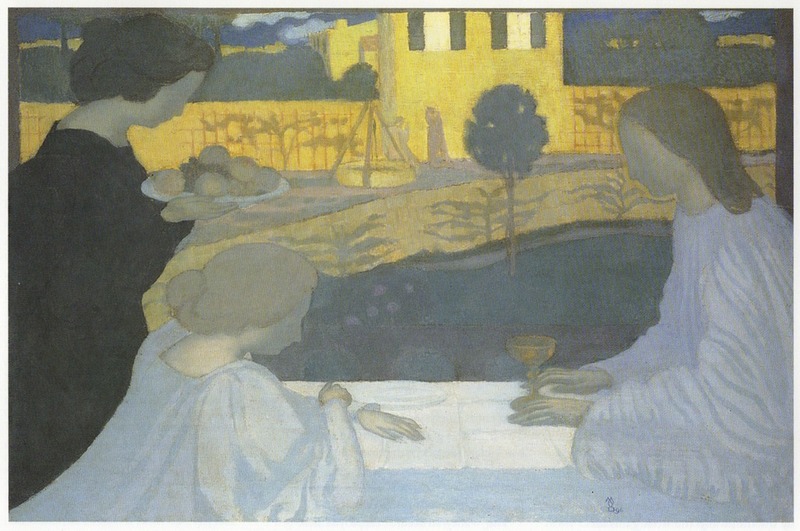 Sérusier soon proclaimed himself to be as much a disciple of Lenz as of Gauguin. Both Sérusier and Denis visited the different places in which the Beuron monks were working - Prague, Monte Cassino (St Benedict's monastery in Italy) and Beuron itself. 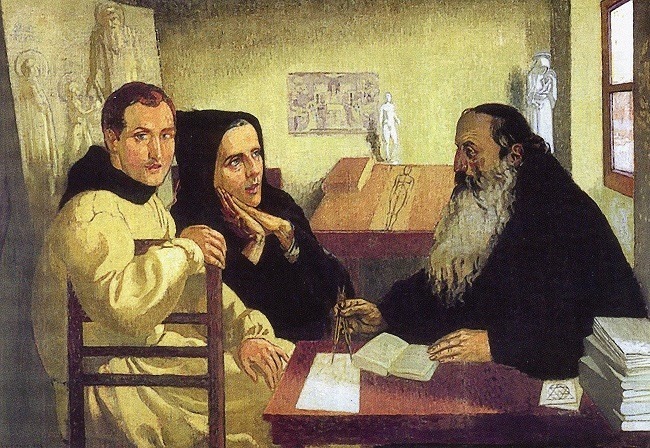 Denis painted a beautiful (though very naturalist) picture of two young monks being taught by Lenz, Sérusier translated Lenz's theoretical statement The Aesthetic of Beuron and published it in 1905, with an introduction by Denis. Much later, Denis revealed the full scope of Sérusier's and his own interest in Beuron in his Life and Work of Sérusier, published, under the German occupation, in 1942, shortly before his own death. Lenz's aesthetic theory was based on number and he argued that this mathematically based had found its earliest and highest known expression in Egypt. 'It was certainly not an idealist theory. An immediate consequence of the positivist philosophies then in vogue and of the inductive methods which we held in such esteem, it was in truth the most strictly scientific of artistic endeavours. Those who launched it were landscape painters, still-life painters, not "painters of the soul" at all (influence of Cézanne upon Gauguin, Bernard etc.) They were minds passionate about truth, living in communion with nature and, I am quite sure, without metaphysical ideas. If they were led to "deform", to compose and finally to invent surprising formulas, it is because they wished to submit to the laws of harmony which determine the correspondence of colours, the organisation of lines (the researches of Seurat, Bernard, C.Pissarro): but also to bring a greater sincerity to the rendering of their sensations. Given the structure of the eye and its physiology, the mechanism of association and the laws of sensibility (insofar as we can yet know them) [this is Charles Henry's territory - PB] they drew from them the law of the work of art and immediately, by conforming to them, they obtained a more intense expression. from then on, instead of searching, ever in vain, to recreate their sensations just as they are [as the Impressionists had tried to do - PB], they applied themselves to finding their equivalents [ie the Neo-Impressionists, Seurat and Pissarro, like the Neo-traditionalists, became Symbolists - PB]. 'Once again, in our century so preoccupied with the Divine, a reaction of the religious spirit corresponds in painting to a recovery of the Byzantine idea. Our painters such as Puvis de Chavannes or, above all, Odilon Redon (to mention only masters inspired by Christianity) acted not only on the intelligence but also on the conscience of their time. In restoring to painting by force of audacity and genius the logic of its essential laws, they have reconnected with the Christian tradition. They have (as Verkade has said, speaking of the Byzantines) "imitated the Creator who has made all things according to measure, number and weight, who is Himself absolute order."